The Oakmark Select [OAKLX] Fund has a 24% weighting to technology, and the flagship $11 billion Oakmark Fund (OAKMX) has a 19% weighting. At 12.9, the price to estimated 2014 earnings ratio of the information technology sector is lower than that of classic value sectors, such as consumer staples (15.9) or utilities (14.7). In addition, the 13.1% year-to-date return of the sector trails that of the overall S&P 500® (19.1%). Finally, the price-to-earnings-growth (PEG) ratio of 1.0 for the sector matches that of consumer discretionary for the lowest value of all sectors. In a low-interest-rate environment maintained by the Fed, investors in search of dividend income have pushed the PEG of the consumer staples sector to 1.7 and telecom services to 1.6. While the emphasis on technology stocks may improve the funds’ performance, as shown in a previous Alpholio™ post, past selection of securities in OAKMX did not lead to spectacular results when measured on a truly risk-adjusted basis. Therefore, investors should view the latest attempts with caution. Fidelity Investments is about to introduce a set of ten sector ETFs that will compete with similar products from State Street (Select Sector SPDR), BlackRock (iShares) and Vanguard (sector-specific ETFs). The new ETFs will undoubtedly complement the current offering of 65 iShares ETFs that can be traded commission-free in Fidelity accounts if held for more than 30 days. The expense ratio of these ETFs will be 0.12%, lower than the average of 0.18% for SPDRs, 0.45% for iShares and 0.14% for most of Vanguard ETFs. However, in addition to reported expense ratios, investors should also take into account trading costs, including bid/ask spreads and premium/discount to the net asset value (NAV) of each ETFs. With the highest trading volumes, SPDR ETFs are leaders in that respect. *The SPDR® S&P® Telecom ETF (XTL) is not part of the original Sector SPDRs; its expense ratio is 0.35%. 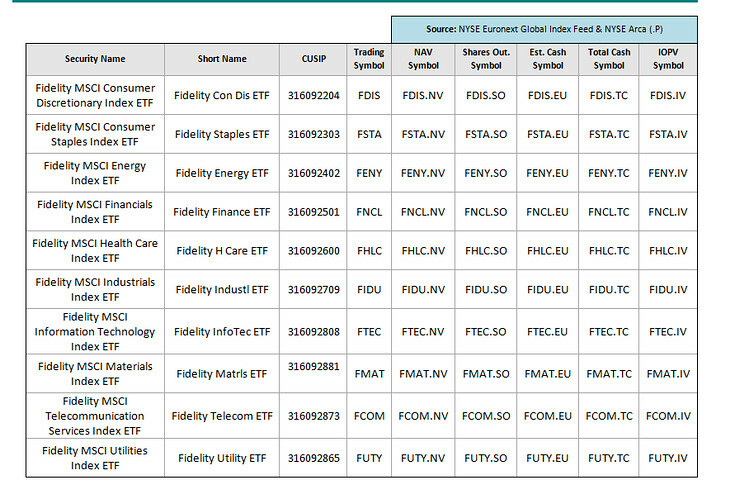 The new Fidelity sector ETFs will track MSCI IMI sector indices. In contrast, the nine SPDR ETFs track S&P sector indices that collectively represent all stocks in the S&P 500® index. iShares ETFs track the Dow Jones U.S. sector indices. As of February 2013, Vanguard ETFs track MSCI 25/50 indices that cap each fund’s exposure to stocks dominant in a given sector. From Alpholio™’s perspective, these sector ETFs should benefit investors by expanding the pool of securities that can be used to build substitution portfolios for actively-managed mutual funds in a cost-effective manner (low expense ratio, commission-free trading).